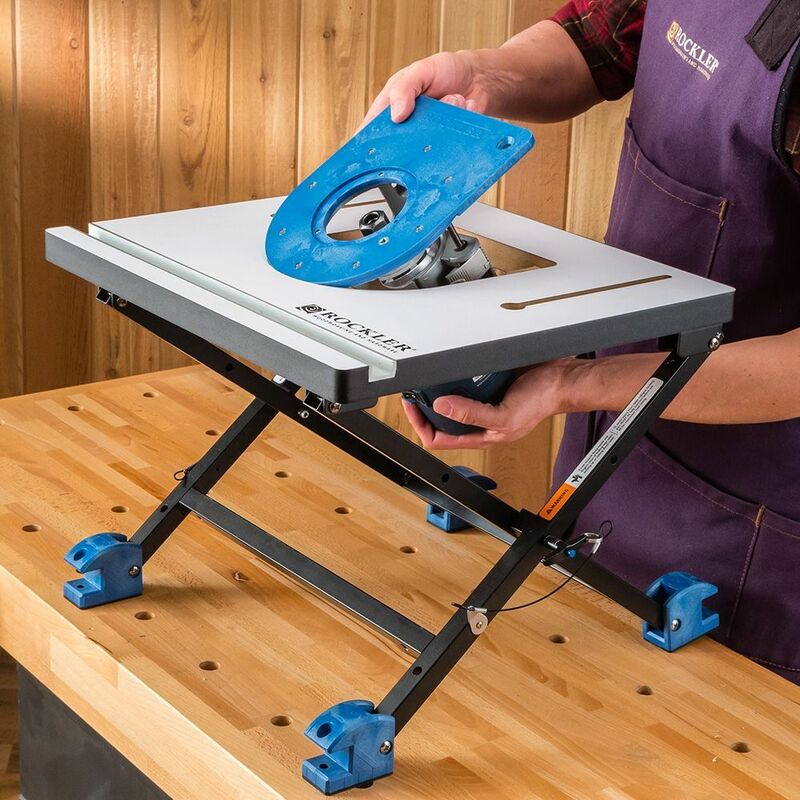 Quickly pull out the router for freehand use; base converts from benchtop to wall-mount mode – Choose table and baseplate package that fits your router! 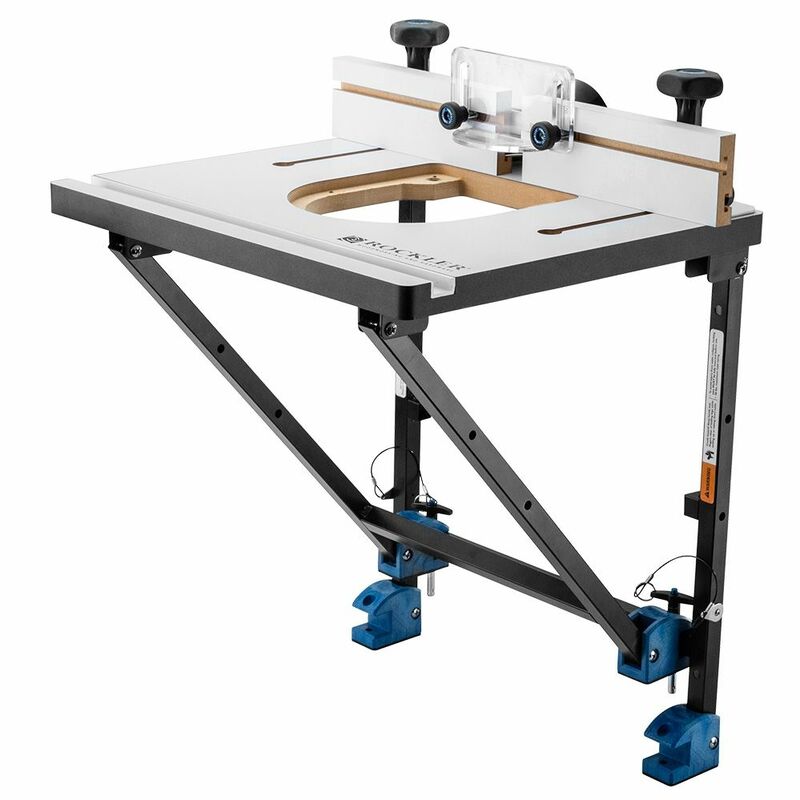 The folding base on our Convertible Benchtop Router Table can be quickly reconfigured for benchtop use, wall-mounted use, or collapsed entirely for storage or transport. 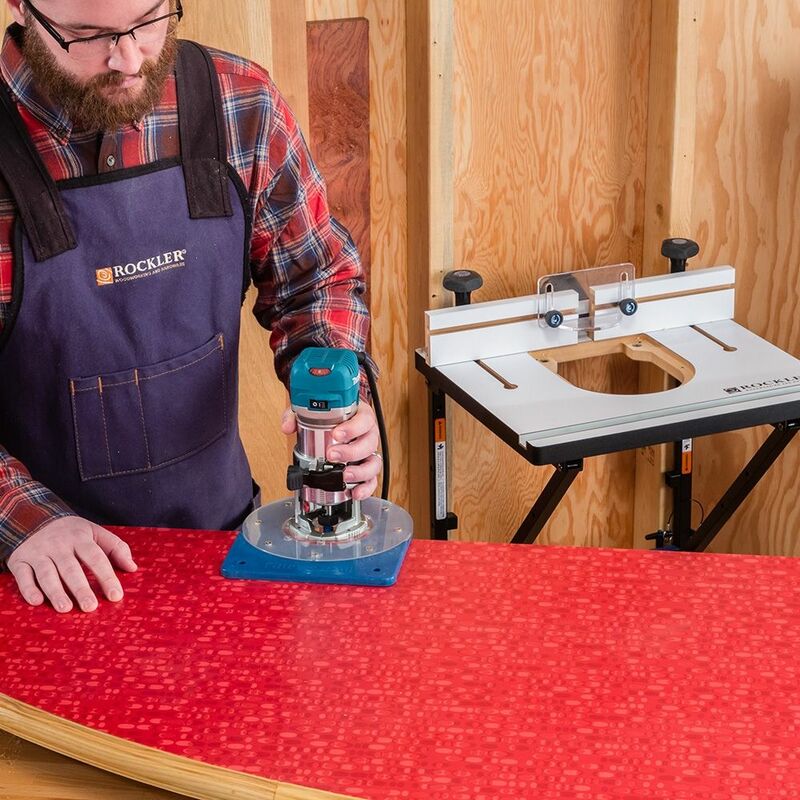 In addition, the unique router plate lets you quickly remove the router for freehand use, then dock it again for table use—the compact size of the plate makes it light and nimble in freehand applications. 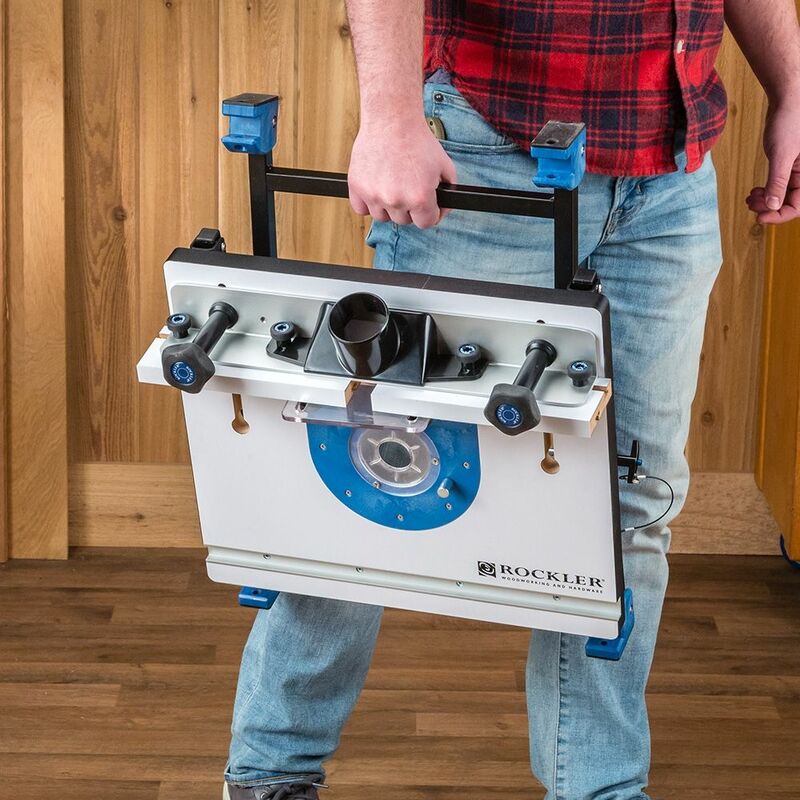 Compact and portable, yet full-featured, the table is ideal for small shops and jobsite use. 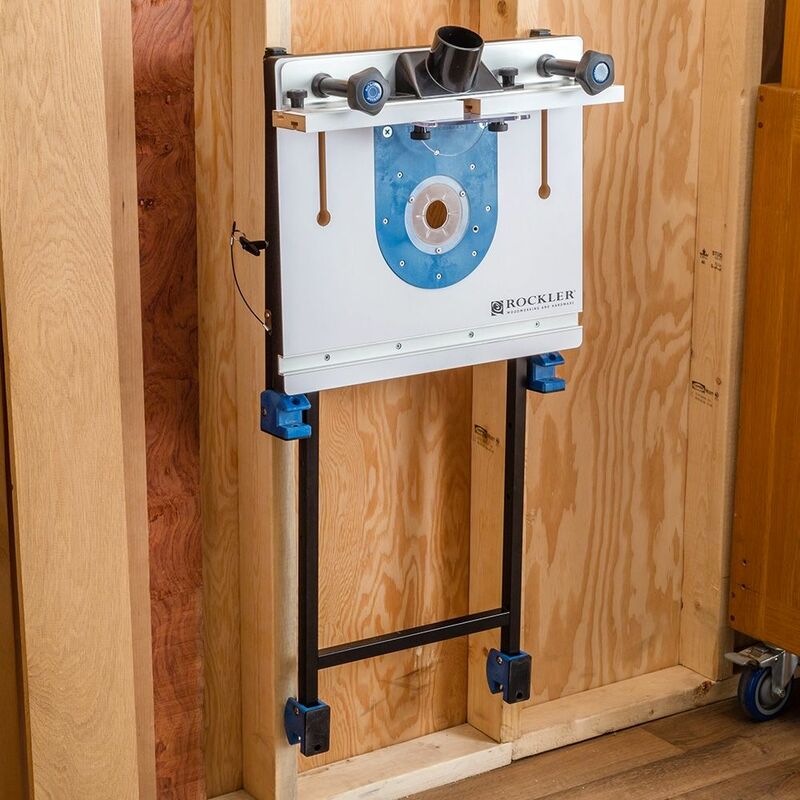 Triangulate the base and mount it to the wall of your shop or to stud walls on the jobsite. Use it on your benchtop or on the tailgate of your truck, then collapse it and tuck it under the bench or into the truck cab. The Mid-Size plate’s two-piece design lets you attach your router at the correct angle so that the handles fit through the table opening. Will my router fit? 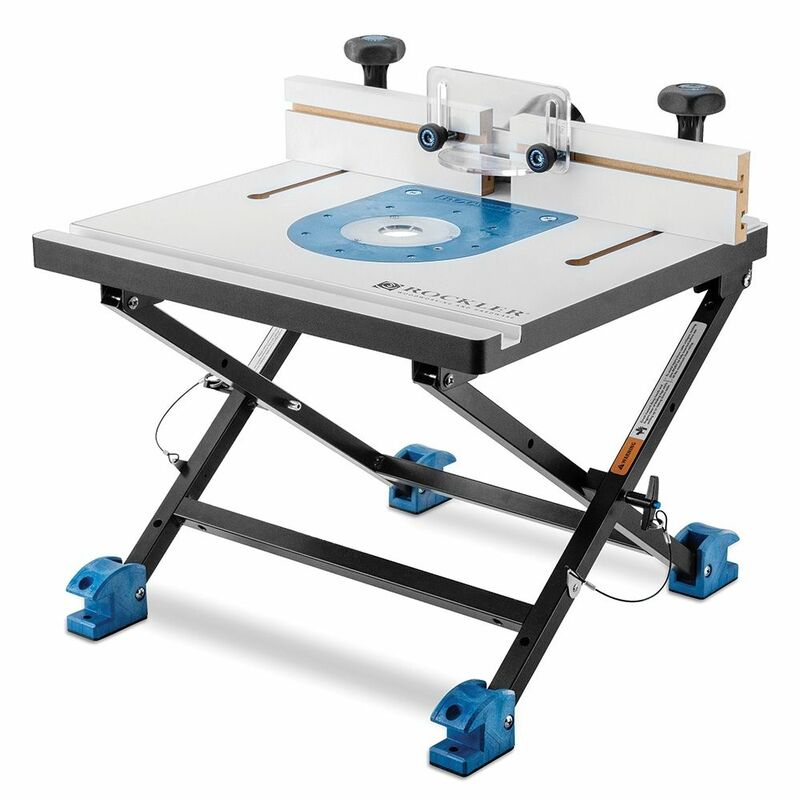 The Rockler Convertible Router Table will accept most compact and mid-sized routers. It will NOT accept plunge routers or large routers like the 3-1/4HP Porter-Cable. 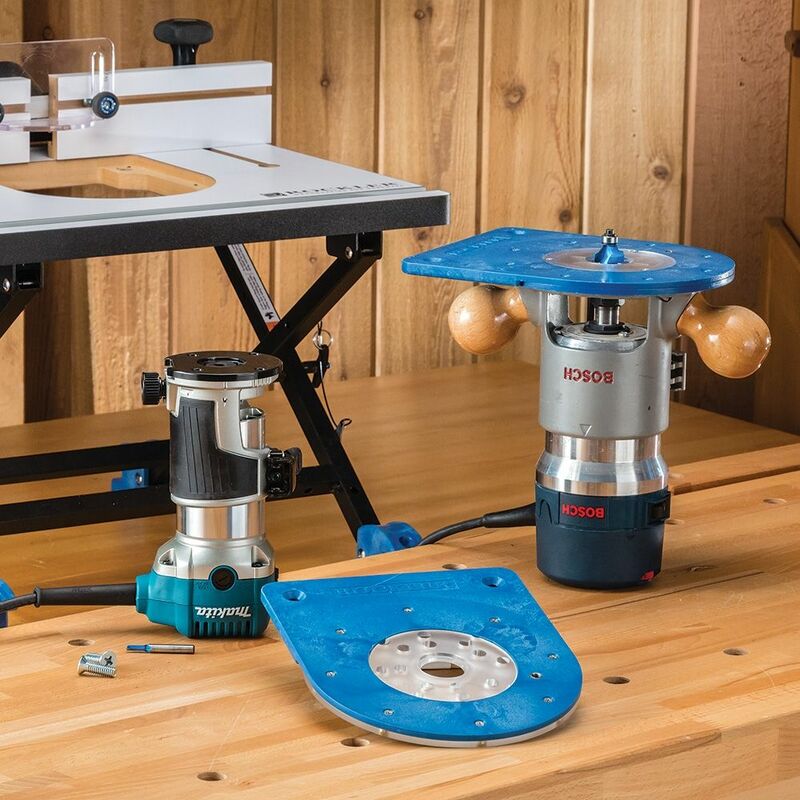 It will also NOT accept the Porter-Cable PCE6430 Laminate Trim Router and the new Bosch Colt GKF125CE, due to their unique bases. Overall Weight: Approximately 15 lbs. Weight Capacity (including router): 40 lbs. For use with router bases less than 6-1/4" dia. I love this little compact router table. I love this little compact router table. I don't have much space in my garage, certainly not for a full size router table. This table can be wall mounted. I actually mounted it on the side of my workbench using 2x4's. Cool folding table. Stores and moves as needed. I was looking for a portable router table and zero'd in on the Rockler because of it's size and portability. Set's up Quickly and is really stable. My only complaint is that it's a little too tall when I set it on a workbench height (36") table. I have only used my table three times now and find that it fits my needs perfectly. I have a 10'X10' work shop and the storability is very important. I find that set up and take down are easily accomplished. The initial set up of the table took a little longer than was anticipated but once completed it was found to be sturdy and accurate. My Bosch router fit as advertised and works great. The construction and material are first class. I would recommend this for any small shop. I have a small 10x20 utility barn workshop and this is a godsend. It is a big upgrade from the 1/2" birch plywood table I've been using - it has a fence!!! - and the dust collection works well for me uses. I haven't attempted rails and stiles or raised panels, but simple edge work has been blessedly easy. It transports well and shows a lot of fit and finish of a well-designed product. Got my table just the other day and assembled it per instructions. However, instruction #11 states to insert the socket head set screws in the five holes in the base plate well and tighten them with the hex wrench. The set screws and the holes were the same size so the screws fell right thru the holes,. Fixed it by buying some #8-32 brass threaded inserts, drilling the holes to accommodate the inserts and then the set screws were able to be threaded into the inserts and tightened. these are to level the router base plate with the table top when installed. Other than that I think it will be a welcome addition to my tool inventory. as others have stated the leveling screws do not fit the holes drilled in the table they are too small & therefore worthless. I would think Rockler would have fixed this issue since others have complained about it before. I bought this to use with a Bosch 1617EVSPK and regret it. The handles of the Bocsh make it impossible to pop out easily as advertised, so every time I need to remove it I have to unscrew about 12 tiny screws from the faceplate. Since it doesn't store small while the router is in place (the whole point of this table) that means, i have to unscrew all the screws every time I use it. Otherwise, it seems well made and folds well, so with other brands of routers it may be fine. Router table comes with socket-head screws for leveling the base plate, but the screws are too small for the pre-drilled holes in the bottom of the router table, so they are worthless. 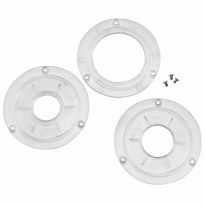 Also, the base plate comes with a bunch of flat-head mounting screws for replacing the factor base plate on your router. They give you lots of screws so you can figure out which ones will replace your existing screws. I have a new Porter Cable 892 that I purchased from Rockler a few weeks ago and none of the screws fit. The table seems well constructed and will likely meet me small routing needs, but I can't give it more than two stars if I have to go hunting for parts at the hardware store because the parts in the box are the wrong sizes. Nice table but without insert rings for the compact insert it does not meet my needs. I Purchased the table with the compact router insert. I just put it together and I like the compact size and the way it folds up. The adjusting screws to level the router Plate are a good feature. I do not like that you can’t buy the different insert rings for larger router bits for the compact insert. I have many router bits that are too large to fit through the 1-3/16 hole supplied with the insert . 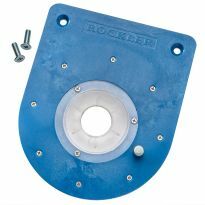 Rockler says that they will notify me when the insert rings are available for the compact insert. I hope this is true because the table will be almost useless to me for many of the functions I perform. I would rate it a 4 if they supply me with the larger insert rings that they promised are coming. Looking for a compact router table for my small shed shop. Will this work with a Craftsman 320.17543 router? 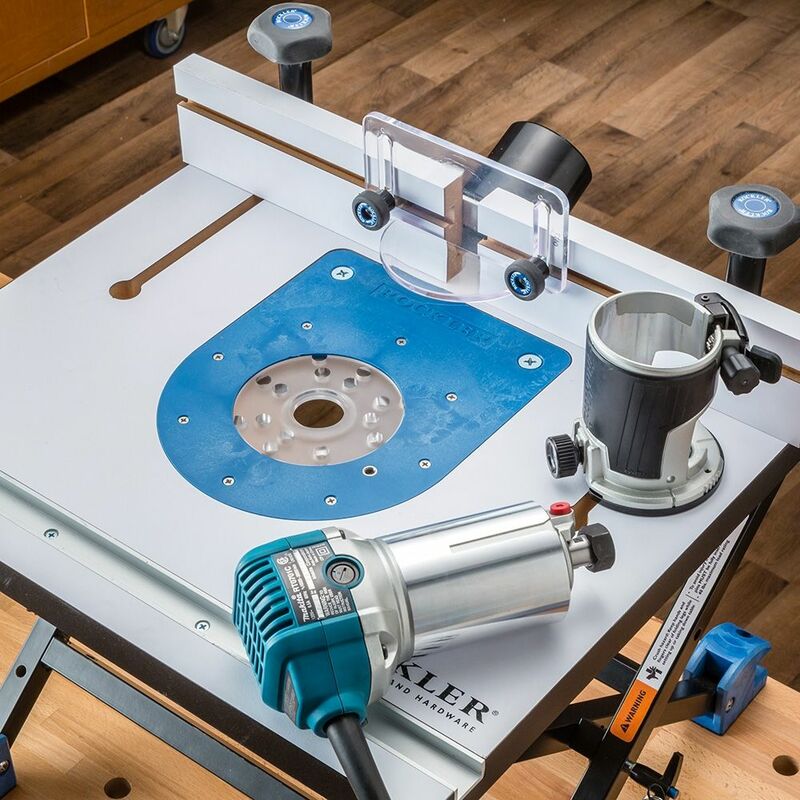 BEST ANSWER: The Rockler Convertible Benchtop Router Table is pre-drilled for many popular mid-size and compact Routers, and can be drilled for other routers. It will NOT accept plunge routers or large routers like the 3-1/4HP Porter-Cable. BEST ANSWER: I just went to the store today to measure for this. You will have to drill your own pattern in a blank plate. The Ryobi P601 has a 4 point mount with the holes being 2-3/16" apart. The mounting plate that comes with this table only has one 4 point pattern but those holes are 2-3/8" apart. Hope this helps. Hard to say, but palm routers are usually smaller than "compact" routers. 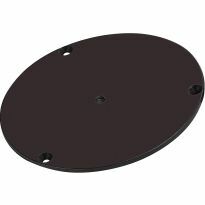 You could always consider drilling new holes in the plate to fit your router pattern. This table doesn't come with a miter gauge. Can an Incra gauge be used? would Ryobi #R163R router fit on this table? Will this work with the MRF23EVS router that you sell in your stores? 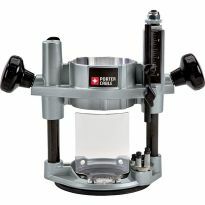 Would this fit the fixed router on a Milwaukee 5616-24 2-1/4 Max-Horsepower EVS Multi-Base Router Kit Includes Plunge Base and BodyGrip Fixed Base? BEST ANSWER: Don't have that kind of router, can't answer your question. Will this table work with a Dremel 3000 o 4000...? BEST ANSWER: The Dremel 3000 and 4000 are handheld rotary tools and as such are not compatible with this router table. yes I know that, but dremel has router bits to work with. In fact, it also has a router table but isn't such functionality like this one have. So I wonder if some model of this table (compact, mid-size or another one) fits dremel. Is the mid-sized router plate pre-drilled for the Ridgid R22002? What router would be best for 2"Lock Miter bit? BEST ANSWER: I would suggest the Bosch 1617, Porter Cable 890 series, or another similar router. Variable speed will be important, as will the 1/2" collet, and 2 HP or more will provide the necessary power. 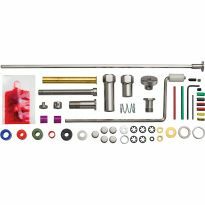 Depending on the material you are creating the lock joint on, you may want to set up for more than one pass to provide a smooth, chatter-free joint. Thank you was hoping that I would get a good answer. I think the best router will be one with variable speed settings since your speed should be around 12,000. After that, you will want to consider getting one with enough power so that it doesn’t bog down with the materials you’re routing. Finally you will need to consider where the router will be mounted and if the plates are adaptable for the router you select, especially if you are using a table. 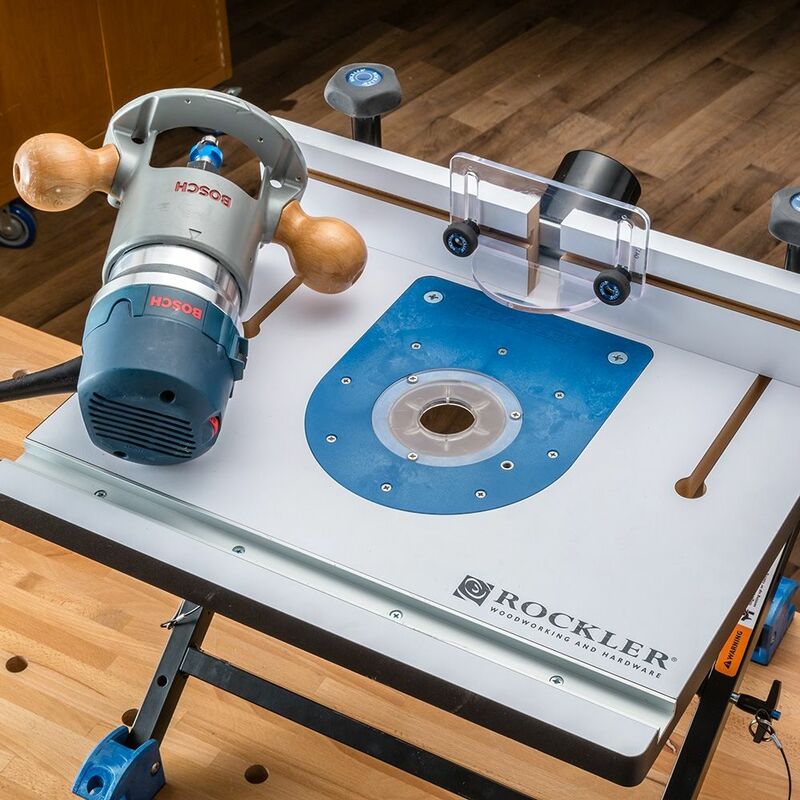 Will you be able to use the Rockler box joint jig on this table? The 19" height is to high for any of my bench/work tables. Can the height be lowered? BEST ANSWER: A good excuse to build another work bench and beef up the shop. Will this fit a Craftsman 315.25070? Is there anyway to adjust your depth of cut, or can you put a lift in this table? I am rather new to routers but on my router (Dewalt), the depth of cut is controlled by adjusting the router by loosing the collar of the router and turning the router body left or right. I use a Bosch router that has a base with a vertical adjustment. It bolts to bottom of table. Easy to adjust depth of cut with precision. Is the router table 29.99 or is that a type o? I’m not sure why this was sent to another customer to answer but I would say it was a type O.
Hello Guys, how could I represent you in Brazil? BEST ANSWER: Doesn't Rockler read these questions first? This certainly is not a user question. I am an end user, your question should be directed to Rockler. Does it have emergency shutoff, or can it be added? No electrical at all. Just a table, mount plate, and fence hardware. will this fit a Makita RT0701C ? 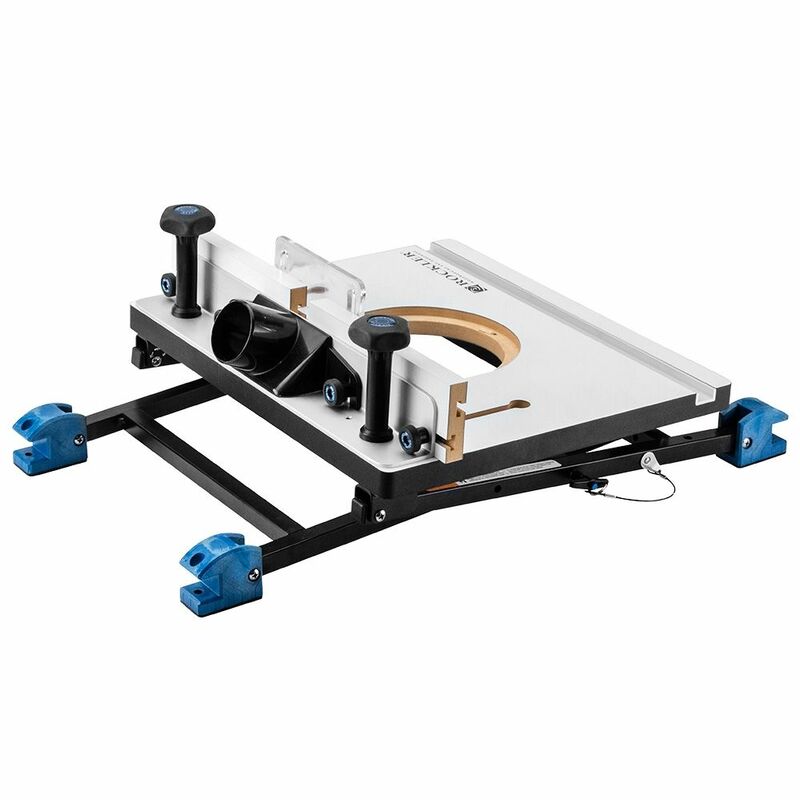 BEST ANSWER: The Convertible Benchtop Router Table Baseplate, Compact - Item 53910 - will accommodate the Makita RT0701C and Makita RT0700C Routers along with a number of other Compact routers, such as the Dewalt 611 and Porter Cable 450. Hi David - thanks for answering his question. You should have someone update the product page because the only Makita listed as compatible is the mid-size 1100 series. The RT0701C is pictured in the product photos but it is not listed as compatible. 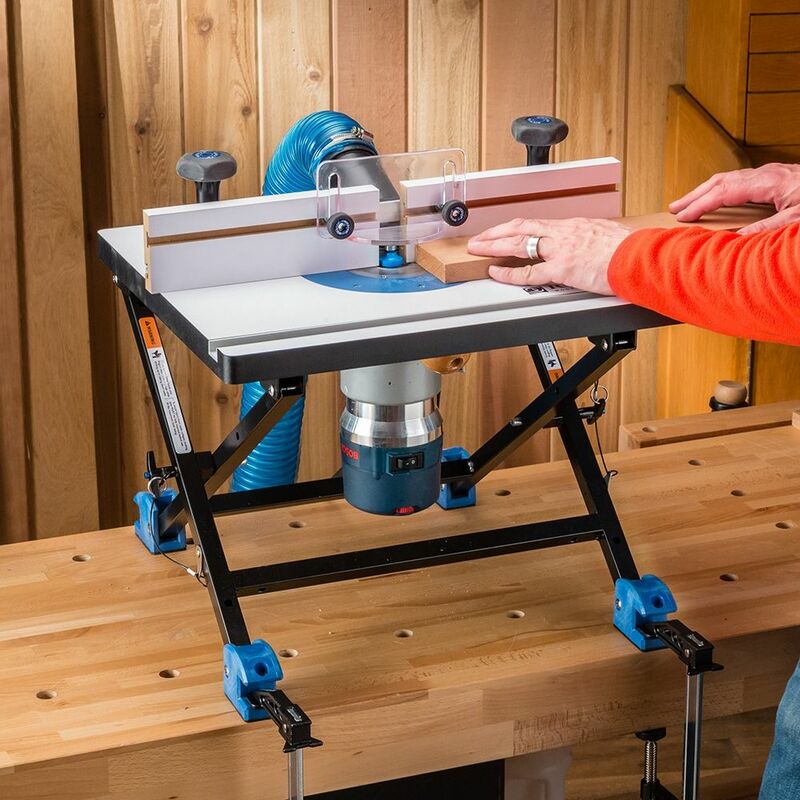 The Rockler Convertible Benchtop Router Table is pre-drilled for many popular mid-size and compact Routers, and can be drilled for other routers. In the instructions for the 53910 Baseplate it actually SHOWS a picture of the Makita RT0701C, not only in the main photo, but also where the baseplate is being attached to the router itself. This makes it seem like it would fit WITHOUT any modifications. If it DOESN'T accept the Makita router without modifications it should not be the ONLY router listed in the instructions. Can we please clear this up? This is the only issue I have before clicking "check out"
The Convertible Benchtop Router Table Baseplate, Compact - Item 53910 will accommodate the Makita RT0701C and Makita RT0700C Routers along with a number of other Compact routers, such as the Dewalt 611 and Porter Cable 450. Perfect, I'll be completing my purchase tomorrow morning! Can wheels be purchased separately? It seems that the legs could be secured to boards and casters mounted to the boards. Wheels on a router table are not really advantageous. You need something that isn't going to move around while you are doing your work. Will this table assembly work with a Bosch 1617EV router and the RA1165 under the table base? BEST ANSWER: This table assembly will work with a Bosch 1617EV router and the RA1165 under the table base. I have a Bosch 1617EV fixed base on my table and it works great. I'm not sure what a RA1165 is but the insert that came with the table my router base mounted up with no problem. Thanks for the help. 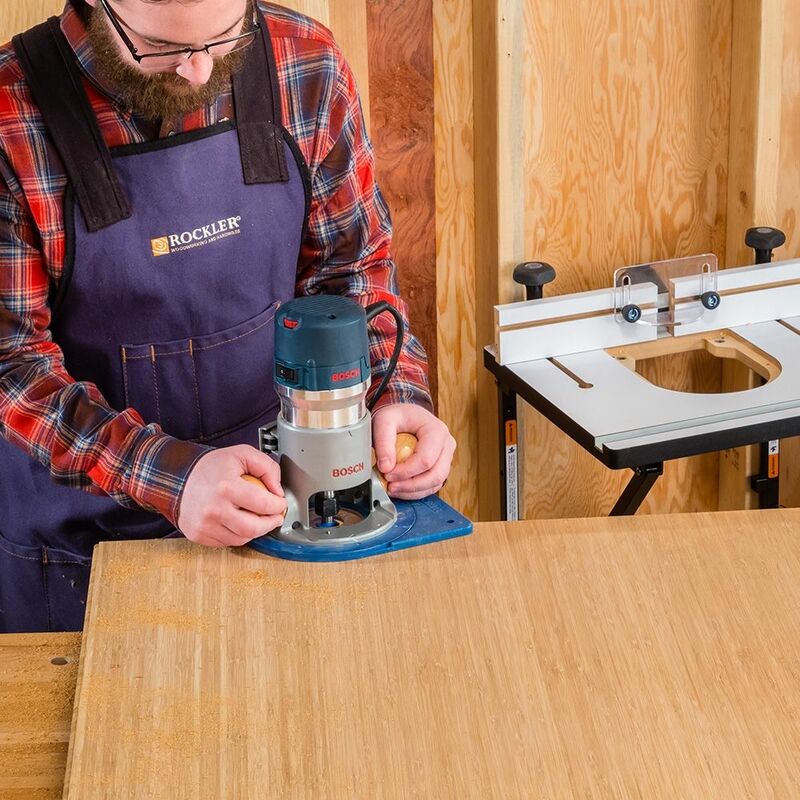 The Bosch RA1165 is an Under-Table Router Base with Above-Table Hex Key lift. Does this router table have a starter (safety) pin? BEST ANSWER: The Convertible Router Table insert is threaded for a Fulcrum Pin (item number 20692). I have a ridgid 2 hp 1/2 in fixed base router. Will this table work? BEST ANSWER: I would not use any router rated over 1hp. It work well for me with the Dewalt 1hp, but I don't think the "portable" router station is rugged enough should a workpiece get jammed or kick back. I have a 2.5 HP Makita router installed on a my shop made tablesaw extention….seems to be an economical way to go. Lots of plans out there on this setup. Hope this helped. BEST ANSWER: You should go to the Rockler website and look at the compatibility chart - but as many holes as the insert table has, I would be surprised if it didn't fit. Make sure you choose the [full-size] insert table. What is meant by compact and Mid-size? BEST ANSWER: Compact routers are also called "palm routers" or "trim routers" and normally provide 1 - 1.25 H.P. with 1/4" collets. Mid-size routers include fixed base and plunge styles and typically provide approximately 2 - 2.25 H.P. with options for plunge and fixed bases. will this work with Porter Cable 1001 router? BEST ANSWER: When you purchase the table, you select which base plate you want - 1 is for compact routers and one is for full-size routers. I believe the Porter Cable 1001 router is a full-size so that's the base plate you'll select. is the fence a split fence that can be used as a jointer? 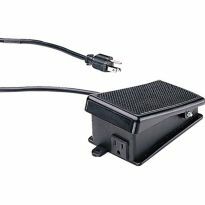 It doesn't appear that connecting to the dust collection port would be easy or even possible if this table is mounted to a wall with sheetrock on it. There is room for the vacuum hose if a stud bay is available. Is there sufficient room for a vacuum hose when the wall is sheathed? How is the hose routed - up and to one side or is there room to go down below the table? BEST ANSWER: It all depends on how far back you need the fence. In the photo they show, the fence is pushed all the way back, but you wouldn't normally work with your fence so far from the bit. You can still attach it to the collection port and hand the hose vertically or off to the side. Obviously with sheetrock you wouldn't be able to mount it behind the table and down the wall since the table would be pretty flush to the wall, so your hose would have to hang off the side behind the fence. Purchased this table. Have a compact DeWalt router. 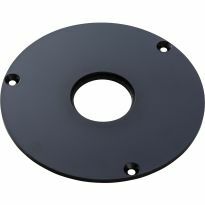 Does not have other router plates with larger openings. The bit I used was difficult to use because the opening needed to be larger. 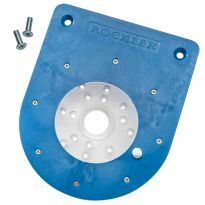 Does Rockler plan to offer additional plates like it does for Mid Size routers? If not they need to do so. Please advise. BEST ANSWER: The item number for the midsize plate is 55512. I believe the mid size and larger inserts you mention are for the Mid Size router plate. I have a compact router plate that there only seems to be one size insert. WILL THIS TABLE WORK WITH A CRAFTSMAN 315.17381 ROUTER? How do you get the black leveling screws to work ? Can you use the mounting shims with this model?